This has been another great year for Future Problem Solvers and Community Problem Solvers students in Flagler County schools. The following summary of results from the 2019 Florida FPS Affiliate Competition in Orlando this week shows just how seriously Flagler Schools takes FPS competition. A total of 332 students attended the Florida FPS Affiliate competition from six different schools: Flagler Palm Coast High School, Indian Trails Middle School, Buddy Taylor Middle School, Rymfire Elementary School, Bunnell Elementary School & Old Kings Elementary School. These Flagler Schools students brought home a total of 236 awards, including one “Best Writer” and four CmPS “Grand Champion” projects. No fewer than 72 students from three schools received invitations to compete at the FPSPI International Competition June 5-9 at the University of Massachusetts-Amherst. Flagler Palm Coast High School: Coaches: Diane Tomko, Caitlin Hutsell and Sarah Reckenwald. Indian Trails Middle School: Coaches: Jennifer Colindres & Judy Colindres. Rymfire Elementary School: Coaches: Tim Ruddy, Amy Kopach, Caryn Burris, Kate Sturman, Judy White & Jennifer Lujan. “T.R.A.I.N.” (Training Rescued Animals in Need), Ashley Kassan, Wyatt Christlieb, Jacob Moss, Aria King, Desirae Astrologo, Desmond Akmentins, Jasmine Santana, Nyla King. Coach: Kate Sturman. “P.A.L.S.” (Positive Acts Lift Students), Samantha Newell, Halley Londono, Marion Clayton, Anna Gimbel, Kade Manley, Jack Wronowski, Kyleigh Brown. Coach: Tim Ruddy. The above results are just the tip of the iceberg. Let’s recognize all the students who came home with awards from state competition. Click for fuller lists of competitors and awards for Bunnell Elementary, FPC, Indian Trails, Rymfire Elementary. For more information on FPS in Flagler County, go here. Donations are accepted, and sponsorships are available to help students attend the International Competition. The cost for students, including registration, lodging, food and travel expenses is approximately $1,100 per student. Flagler FPS works year-round to raise funds with the sole purpose of reducing the cost for students to attend an International competition. Flamingo Flocking is our signature fundraiser; however, we have other opportunities available for the community to get involved. Please visit online. 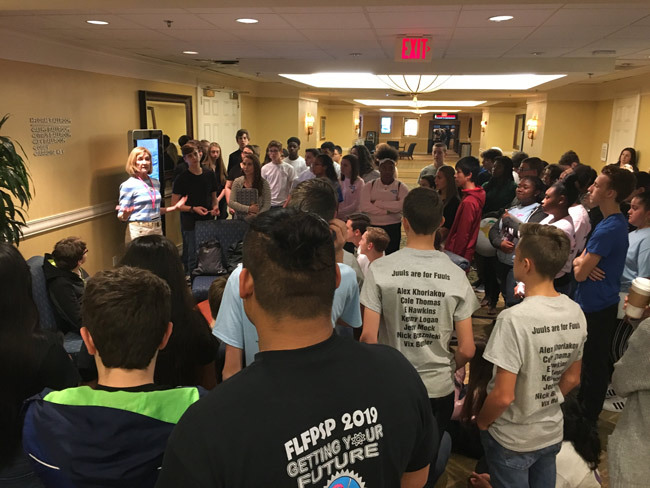 Every March, the Florida Future Problem Solving Program brings together the affiliate programs from all over the state for two days of competition. Flagler Schools has a strong history of excellence at the state competition, thanks to Flagler Palm Coast High School educator and FPS coach Diane Tomko. Ms. Tomko introduced FPS to the Flagler School District 26 years ago, as a middle school teacher under the tutelage of Belle Terre Middle School Principal Buddy Taylor. She later brought the program with her to FPCHS, and it has flourished ever since. The program spread throughout the District and now includes five elementary schools and both middle schools. Ms. Tomko is retiring this year, and we want to thank her for her vision and commitment to excellence that established and maintained the FPS program for so many years. Andy Dance is a Flagler County School Board member. I think some of these students should work with the city council and BOCC and the students might come up with some very worthwhile solutions or at least doable ideas on how to fix some of the issues we have. Congratulations to you all, good job! Nice to hear about the good things that are happening at Flagler County Schools.Job well done. Great job young people, you have bright futures ahead. Congratulations to all involved and made these wins/recognitions possible. Hopefully the City and Flagler County will consider/implement their ideas.